Here we have 5 perfect saucers in the blue willow pattern. Made in Churchill England. Price is for each. 5 1/2" in diameter. These nice large diner plates are in perfect condition.Dark deep blue on white under glaze. Marked Churchill England. Dishwasher & microwave safe. I have 8 available. Price is for each. This is a hard size to find in this pattern. 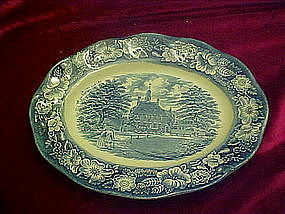 It is the 7" salad plate in the historical colonial scenes, Liberty Blue pattern staffordshire England. The scene is Washington leaving the Christ Church. I have 6 available and all are in perfect condition. See other pieces to this set in my catalog. 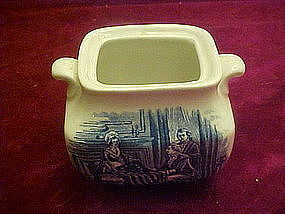 Historical Colonial scenes by Staffordshire England in the popular Liberty blue pattern. This is the governors house Williamsburg. Measures 12" long and in in pristine condition. A great addition to your collection. 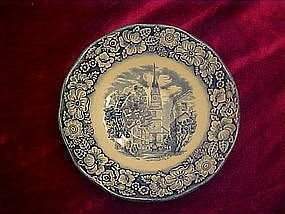 Historical colonial scenes in the liberty blue pattern, Staffordshire England. This is a single saucer in perfect condition. I have 4 available. 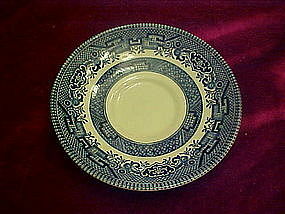 Staffordshire Liberty Blue 5" dessert bowls ae perfect for fruit or sauce. The center scene is of Betsy Ross and the flag. We have 9 available. all are in perfect condition and price is for each one. 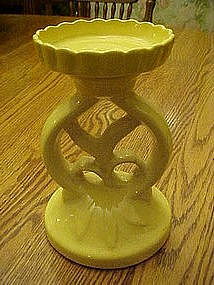 This vintage candle holder is very nice and will accomodate todays big chunky candles too. Not sure of the maker but it is a nice quality pottery, with gentle crazing. No chips, cracks or repairs. measures 7 1/2" tall. Dated 1984 and signed by Xavier Roberts. 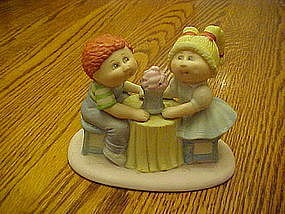 This cabbage patch kids figurine is of a boy and girl at a table sitting with an ice cream soda between them. Measures 3 3/4" tall and is in perfect condition. 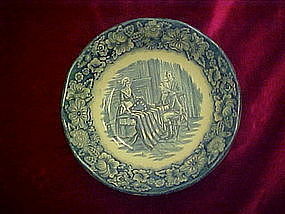 Made of hand painted bisque porcelain. I think there was a little plastic straw in the soda at one time. This is from his Special thoughts for special people line. This is not a large cookie jar but is very detailed. 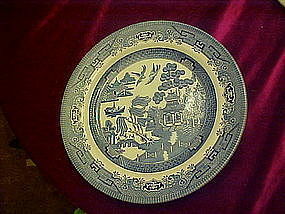 Made of hand painted glazed ceramic, and has no cold paint decoration. The feathers are very detailed and realistic. Measures just 8" tall and is about 10 3/4" long. No cracks, but there is a chip on the inside of the rim (see photo) and some tiny nicks that blend in with the tail feathers. Thus reflecting the low price. It was hand made in 1987. 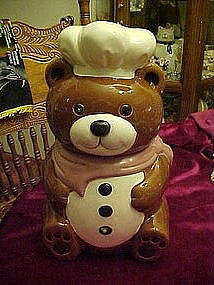 Glazed ceramic bear wears a chef hat and has a neck kerchief. I believe it has been repainted mauve, as I had another that had the original red kerchief. Someone probably repainted to match their kitchen decor. No chips, but does have a spiderweb crack about the size of a quarter under his mouth area. Hard to detect, but is there. 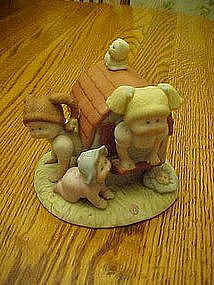 Measures 13 1/2" tall and factory molded B&D copyright on the bottom. 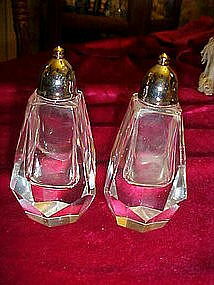 These lovely vintage crystal shakers have a thick cut and are highly polished, with shiny chrome tops. They appear perfect unless very closely inspected, and then you will find a few teeny rough chips on the corner areas. They measure 4 1/4" tall and are so elegant. 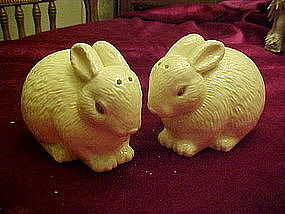 Nice size salt and pepper shakers measure 2 1/2" tall and are about 3 1/2" long. Very realistic looking and made from nice heavy glazed ceramic. Perfect condition with original stoppers. Made by Hallmark. A very pretty and cheery cannister for your kitchen decor. White glazed ceramic with what appears to be sunflowers or possibly daisies. 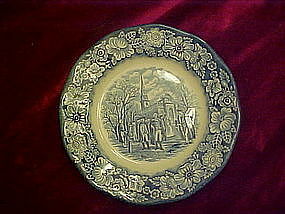 Made of hand decorated glazed ceramic. Measures 11" tall and is nice and roomy for those special treats. Beautiful condition! There is a teeny fleabite on the inner, under side of the rim which is not noticeable but thought I would mention. Pretty little practical jar for the kitchen. 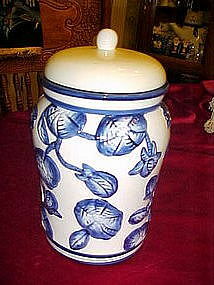 Maybe a small cookie jar but could be used as a treats jar or a coffee cannister. Made of glazed ceramic with a relief decoration of hand painted blue morning glory's. Measures 8 1/2" tall and is in perfect condition. Made by Kamenstein NY, Taiwan. 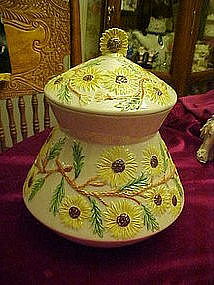 A wonderful whimsical cookie jar for your Christmas enjoyment. Made of hand painted glazed ceramic by Sakura and designed by Debbie Mumm. 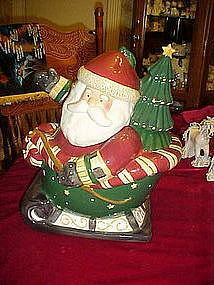 Jolly old Saint Nick waves as he makes way to the sky in his sled. Perfect condition and measures 12 1/4" tall. 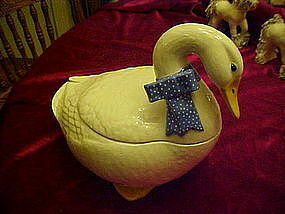 This is a grand cookie jar made by GKHO. Made of hand painted glazed ceramic Nice detailing and relief detail. 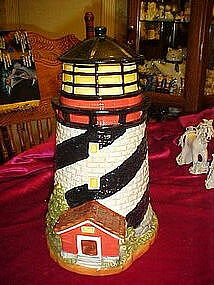 Measures 12 1/2" tall and would be a wonderful kitchen accessory for your nautical / beach kitchen decor. Beautiful condition! !